Navratan Korma with aromatic, flavorful and mildly vegetables. This creamy vegetable curry is the tastiest way to eat your veggies! It’s an enriching Indian dish known as Navratan Korma. 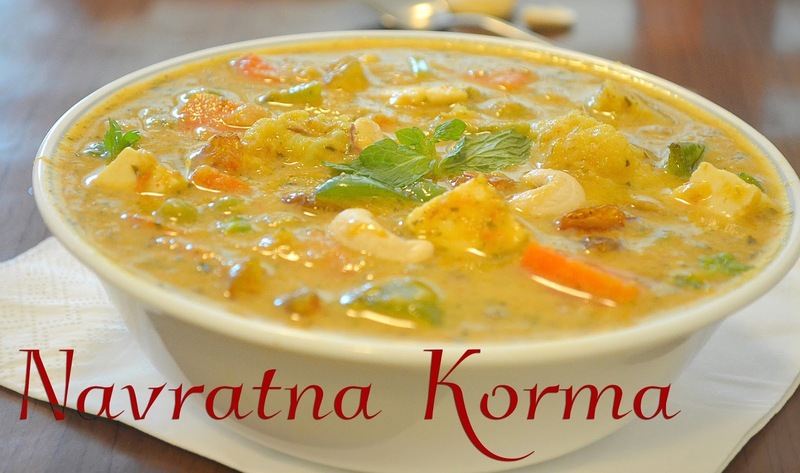 A creamy, delicious and rich Korma made with 9 variety of gems – veggies, fruits, and nuts. This delicious Mughlai dish gets its name Navratan (meaning nine gems) from the nine different veggies. Let’s have a look at Navratan Korma! How to make Navratan Korma? Pour ghee into a pan and fry dry fruits over medium heat. Pour olive oil into a pan. Fry onions and ginger-garlic paste until golden brown. Add salt, turmeric powder, red chili powder, coriander powder, garam masala and fry for 2 minutes. Add dry fruits and stir well and cook the mixture for 5 minutes. Make sure the mixture doesn’t stick to the bottom of the pan. Add water and bring it to boil. Reduce the heat and cook until the gravy becomes thick. Finally, add all the vegetables to the above gravy and cook for 5-7 minutes.